What is Pluto made of? With our telescopes on Earth, we have been able to discover that Pluto’s surface is covered by several kinds of ice – not frozen water, but frozen methane (“natural gas”), frozen carbon monoxide, frozen nitrogen, and a frozen hydrocarbon known as ethane. Frozen water must also be present, but it appears to be “bedrock” that is mostly covered by the other ices just noted. 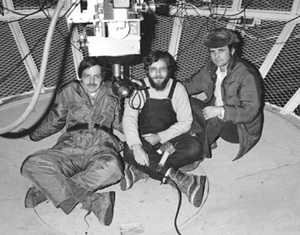 In the mid-1970s, (from left) David Morrison, Carl Pilcher and Dale Cruikshank aimed the 4-meter Mayall Telescope and its powerful spectrometer (located at Kitt Peak National Observatory in Arizona) at Pluto and recorded the signature, or spectral fingerprint, of frozen methane. This discovery was the first indication that Pluto's surface is icy rather than rocky, and opened an era of investigations into the realm of small, icy, outer solar system objects that continues today. The first inkling of Pluto’s surface composition came in 1976, when my colleagues and I found the evidence for methane, and I have been involved in finding all the other molecules that we have identified so far. Pluto’s very low temperature means that nearly any chemical present there is frozen solid on the surface, although there is still a thin gaseous atmosphere surrounding the planet. Pluto is exposed to ultraviolet radiation from the sun and cosmic rays from deep space, and this should produce additional and more complex chemicals, such as other hydrocarbons and hydrogen cyanide. New Horizons will give us an opportunity to find other kinds of ice that are expected on the surfaces of both Pluto and its moon Charon, using the technique of infrared spectroscopy afforded by the LEISA component of the Ralph instrument aboard the spacecraft. Ices are normally colorless, but Pluto has a reddish tint that probably arises from chemicals that are formed on its surface by the radiation acting on the different kinds of ice that we have already identified. Cosmic rays and ultraviolet light break up simple molecules into fragments that reassemble into more complex molecules. In the lab we see that this process results in colored solid material that has a chemical similarity to tar or coal, although tar and coal on Earth originate by entirely different processes. Lab experiments show that if this complex organic material is exposed to liquid water, it transforms into molecules like amino acids, which are thought to be the precursors of life on Earth. Ultraviolet spectroscopy with the Alice instrument may help us detect such material. We don’t expect life on Pluto, of course, but it may be one of the many bodies in space where complex organic chemistry of the kind that occurred on the early Earth is happening now. Dale Cruikshank, an astronomer and planetary scientist at NASA Ames Research Center who specializes in spectroscopy and radiometry of planets and small bodies, will focus on the composition of the surfaces of Pluto and Charon. His expertise covers infrared spectroscopy and radiometry of planets, planetary satellites, asteroids, comets and transneptunian bodies, as well as physics and chemistry of ices and organic materials in planetary settings.